As the celebrations continue and the work ahead looms, I am heartened in the truth taught to us as Muslims and Christians alike that, 'after every hardship comes ease'. PRLog (Press Release) – Feb 11, 2011 – (EGYPT) Reeling from crushing disappointment after Hosni Mubarak sanctimoniously addressed his country on Feb. 10 reiterating the intention to continue imposing his will on the Egyptian people–yet again–by refusing to resign, it was with trembling fingers this afternoon that I posted on my Facebook wall, affirmation of the announcement that Egypt's former president had finally resigned. Actually, I was almost afraid an Al-Jazeera English correspondent would be forced to retract saying, "sorry, it was a mistake...he is still here." But, Subhan'Allah, Al-hamdulillah, it is true. Allah Akbar! After 30-years of suffering the Egyptian people reign victorious over their oppressive, tyrannical ruler; Hosni Mubarak has officially left the building. I could not be happier, or more relieved! I was absolutely dreading the thought that those U.S. Naval vessels sitting out in the Red Sea had a seat waiting for me. I am so thrilled for all of my Egyptian friends and so grateful that I was able to visit them in Tahrir Square because it gives me a truer sense of the jubilant atmosphere...it is just an extraordinary day! I am proud of the Egyptian people for what they have achieved, and I am proud that my own country has a leader who, although he may have seemed at moments to be a little behind on what the Mubarak regime was up to, continued to give us hope that the end result would be what the Egyptian people had been praying for throughout their 18-days of demonstrations. U.S. President Barack Obama, stated, "This is the power of human dignity; and it can never be denied." "Martyrdom does not end something, it is only a beginning. Remember those brave few who stepped-up-to-the-plate in bringing about the downfall of the tyrant and his rotten, rancid regime. We salute all of them," stated Dr. Hatem A. Aly of Cairo, Egypt. Al-Wafd journalist, Ramy El Minshawy, who was reporting on the demonstrations from the Egyptian city of Tanta stated, "Aishah, I think the last chapter of the novel is being written and, insha'Allah, we will see our dreams come true." "The Egyptian people have shown the world what it means to be a true Muslim and what we can accomplish when we are united! The protestors have captured the hearts of the world. Amazing to see how we can make a difference when we have valor, courage and great determination as the protestors of Egypt have done. They not only changed a country, but also taught all of us a lesson in the process." Jennifer Fayed, Muslim American married to an Egyptian. Ms. Fayed is also a member of Muslimah Writers Alliance (MWA). "President Obama was in the right side with democracy and the freedom it represents. He made a new face to America in our hearts," stated international maritime advocate from Alexandria, Egypt, Said Mamdouh, adding, "What we need is a civilian democratic state. I personally also want to start a new legal action to secure the return of billions in Egyptian money stolen by the corrupt regime." "I am happily worried. The system is more than just Mubarak, but now we can start talking about our other demands," stated Reem Tawfik, a student at the Faculty of Fine Arts, Architecture Department. Briehan Khier, a dentistry student in Alexandria, Egypt said, "The Egyptian people have shown the world what they are made of. We protected our streets, homes, and museums when there were no police; we cleaned our streets in the midst of a revolution; and we spoke up and fought back when no one believed we ever would or could. We've been underestimated, especially from within, I am proud to be Egyptian ♥." Poussy Mouselhy, a university student from Cairo, Egypt said, "I just want to say that it took three speeches, 18-days of uprising, 326 martyrs, and thousands of injured people to get rid of Mubarak. I believe we as in Egypt's youth CAN do ANYTHING!" "I have spent different periods of my life living in Egypt over the years and my children are Egyptian. I love Egypt and I can only imagine how they must feel in Tahrir Square. May Allah make their struggle successful," stated American Shireen Hussein, in Kuala Lumpur, Malaysia. "No more fear. We got our dignity back. We have our place in the world. We used to be nothing. Everybody used to step on us. Not anymore. 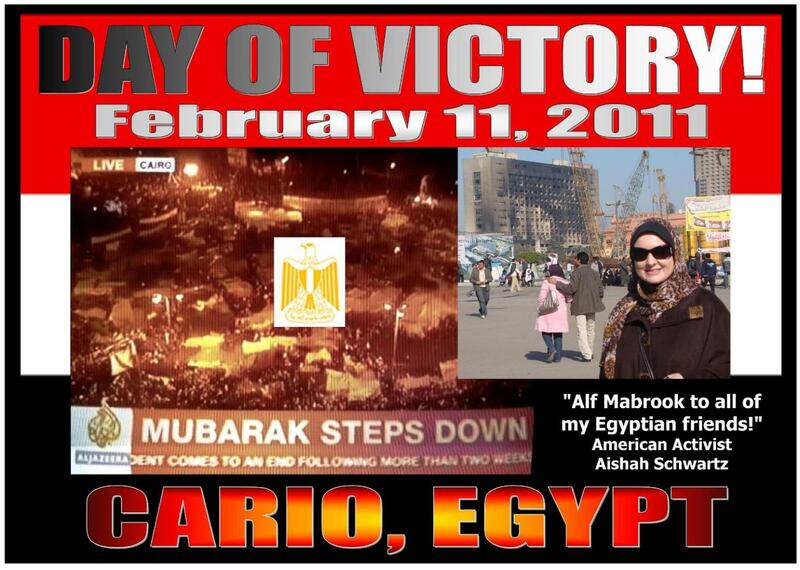 Egypt shall rise and lead the world again," stated Ahmed Shawky Elsify, Texas, USA-originally from Menofiya, Egypt. Khaled Mohamed Elbalishy, of Damietta, Egypt said, "Liberty, loyalty, freedom, fairness and justice are as important as the air we breathe and water we drink; they are essential for all democratic people." "I am proud of the Egyptian revolution and proud to be Egyptian. Egyptians orchestrated lessons of the peoples' will and more importantly in a peaceful way. The Egyptian revolution prevailed against camels, horses, gas tanks, water hoses, police tortures, and all kinds of state terrorism. I am asking the Egyptians to stay stead fast and united. This is the beginning of democracy and a new Egypt. 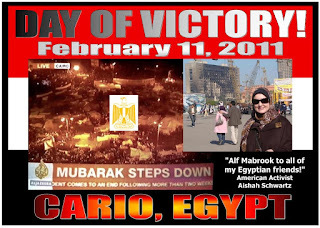 I celebrated today but will hold the complete celebration when the entire corrupted regime departs," stated Egyptian-American and Associate Professor of Accounting Dr. Amal Said, of Toledo, Ohio. "I don't want to take any glory away from the Egyptians, in fact just the opposite, by letting you know that on this day February 11, 21-years ago, South Africa's Nelson 'Madiba' Mandela, was released from prison just like Egyptians have been released from theirs," stated Khulood Arendse, Psychiatric Rehabilitation Assistant, Cape Town, South Africa. Lina Shamiah, a computer engineer from Gaza wrote, "Crazy gunfire celebrating Egypt's freedom! Cars were honking in the streets with a megaphones mounted chanting 'Allahu Akbar, the Egyptian dictatorship is down!' From mosques we could hear chants of 'Allahu Akbar!' We want to spread a message that if you want to experience real democracy, young Arabs will teach you some lessons. Lastly I want to say, we are so proud of the Egyptian protesters!" Mohamed El Sewesy of Port Said, Egypt said, "Many thanks for all who supported our peaceful revolution. I hope that all the people who died on the way will rest in peace knowing that their blood was not lost in vain." Douglas W. Martin T.E., of Daytona Beach, Florida, a former UCLA researcher who has worked in Gaza, "Aishah, thank-you from all of us for your attention to this whole issue and putting yourself in harm's way to cover it for everyone. Peace and good luck to all the Egyptians. Now the REAL WORK begins." "YOU ARE EGYPTIAN....CONGRATULATIONS!!!!!" - Rania Marwan, Author and member of Muslimah Writers Alliance (MWA), from Cairo, Egypt. Dr. Eman Bayoumi, Nasr City-Cairo, Egypt, wrote, "Thanx Aishah, you are in your second country." Wael Ghonim Tweeted, "Please don't make me the face of this revolution. It's not true as every Egyptian was the face of this revolution." Sandmonkey blogged, "Tonight will be the first night where I go to bed and don't have to worry about state security hunting me down, or about government goons sent to kidnap me; or about government sponsored hackers attacking my website. Tonight, for the first time ever, I feel free…and it is awesome!" From Facebook Mahmoud Abu Sharkh, a Palestinian attending university in Cairo Egypt wrote, "I need to sleep! I'm happy, and I think tomorrow will be the start of a new Egypt. Good night Freedom Fighters ♥." #Jan25, #Cairo, #Egypt, #Cairo, #Sandmonkey, #Ghonim, #WhatMubarakIsDoingNow and #CongratsEgypt. Aishah Schwartz, a Muslim American, is an internationally renowned human rights activist with a focus on the rights of Muslim women and the plight of the Palestinian people affected by the Israeli imposed illegal embargo on Gaza. Full biography here.